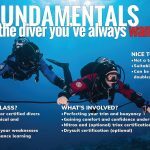 Mentored diving is a coaching experience focusing on general improvements to your diving. Topics will vary and can be a very easy-going environment. Find out more Mentoring & Coaching here. Workshops focus on a specific skill or environment in which you are already certified, but want to improve. They will be more structured than mentoring or coaching, but less rigid than a formal course and certification is NOT offered. Find out more about Workshops here.